In 2004, Prof. Haraldur Sigurdsson together with colleagues of the University of North Carolina and the Indonesian Directorate of Volcanology unearthed a lost village here buried 3 meters deep under ash . “Their houses and culture are still encapsulated there as they were in 1815” said Professor Sigurdsson. They found remains of a house with two preserved bodies of its occupants, more bronze bowls, and ceramic pots, concluding that this may well be called “the Pompeii of the East”, referring to the lost city that was charred by the eruption of Mt. Vesuvius in Italy, but where bodies were preserved intact. The volcano whose peak before the eruption stood at a majestic height of 4,882 meters above sea level had collapsed to just 2,851 meters above sea level. In history, the 1815 eruption of Mt. 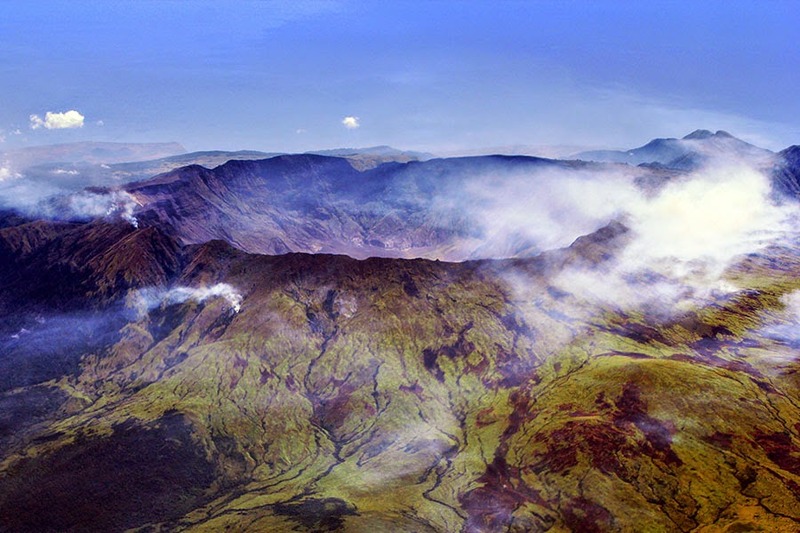 Tambora is recorded as the largest in the world after Mt. Taupo in 181 AD, having reached 7 at the Volcanic Expolisivity Index (VEI) , one of the most powerful in recorded history. To commemorate this catastrophic event suffered by their forefathers two centuries ago, the government of the Province of West Nusatenggara will hold a series of events in April this year named : “Tambora greets the World”. This initiative has been warmly greeted by the people especially of Dompu and Bima, nearest districts to Tambora. Earlier, the West Nusatenggara government organized the Tambora Festival in November 2014, and a joint climb of Mt. Tambora by 60 climbers in August 2014 participated by journalists, nature lovers and the Dompu district government officials, in anticipation of the 2015 Commemoration of the Catastrophic Mt, Tambora eruption. Today Mt. Tambora remains an active stratovolcano that sits on the north-eastern peninsula of the island of Sumbawa in the province of West Nusatenggara. But constant volcanic monitoring has shown that it has remained benign and safe to climb. Today, its slopes are again covered with forests, rich vegetation and wildlife. Before its explosion in 1815, the volcano was the second highest peak in the Indonesian archipelago after Mt. Jaya Wijaya on Papua. But its eruption cut off the upper half of this giant volcano. While its caldera collapsed to become a large gaping hole of 7 km wide, where its crater lies 800 meter below the crest of the volcano’s peak. The explosion on 10 April 1815 was heard as far away as Sumatra, Makassar and Ternate, some 2,600 km distance away from here. 400 million tons of sulphurous gas was thrown 43 km up into the stratosphere, while its thick ash covered the nearby island of Bali killing its vegetation. The surrounding areas within a radius of 600 km were plunged in darkness for two whole days, when even the hot tropical sun could not penetrate the thick layers of volcanic material. Scientists noted that the dust of Tambora was blown around the globe, tearing the thin ozone layer, and stayed in the troposphere for a number of years to fall continuously with the wind and rain on to earth. The following year Europe and North America experienced drastic changes in its climate, seeing hardly any sun, remembering 1816 as the Year without Summer. China, Europe, Ireland suffered failed harvests, and France suffered a famine which caused social upheavals in the country, recorded as the worst famine of the 19th century. While the 1883 eruption of Mt. Krakatau in the Sunda Strait was a gigantic explosion, the Tambora super volcanic explosion of 1815 was four times that of Mt. Krakatau. The Sumbawa people believe that this catastrophe is somehow linked to its ominous name. For in the local language Tambora consists of two words, namely “ta” and “mbora”, meaning “let us disappear together”. But for now, the people of Sumbawa wish to also take the positive side of the eruption, to draw tourists to Sumbawa to commemorate the 200th anniversary of this amazing supervolcanic eruption of Mt. Tambora.